Given my love of rich food and heavy restaurant research schedule, I often receive comments saying, one way or another, "Damn, you must be fat!" There must be some kind of wishful schadenfreude at work here. I'm not. But I do confess to feeling somewhat larger after spending Christmas in Brno. V's mother is a great cook, and I was stuffed like a goose with meaty, fatty, fried, starchy dishes. We arrived back in Prague around lunch time the next day, and I was struck with an inspiration. Why not try some meaty, fatty, fried, starchy dishes at Lokál, the hot, new Czech restaurant in Old Town. 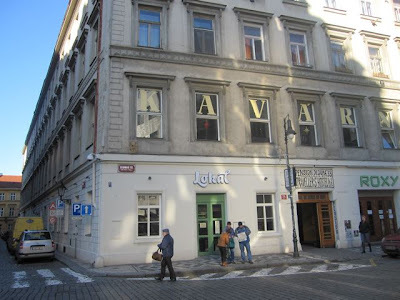 Lokál is the latest restaurant from the successful Ambiente group. 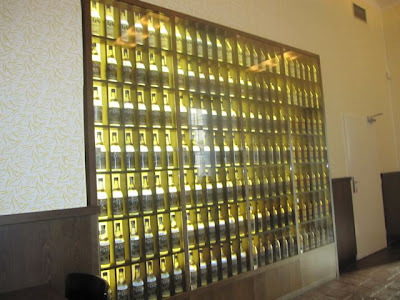 I'm a fan of many of their restaurants, which are known for their quality and attention to detail. The large, long dining spot has been popular since it opened. I'd heard it is almost impossible to get a table in the evening without a reservation. But for lunch on December 26th, we were able to walk in. Still, there were a lot of people there, mostly Czech families. The atmosphere felt rather flat to me. There was no music, just the low rumble of conversation. The walls had fake graffiti carved into wood paneling that is meant to give the place a nostalgic, well-worn feeling. It was a little too much Disney-like fakery for me. As a non-Czech, I thought it was just ugly. Forgive me if the child-like art work touches some chord in your pub-going soul, but a Czech friend was not so impressed either. 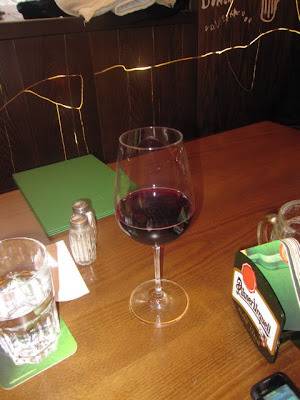 For drinks, V had a .15 liter glass of red wine (78 CZK). She said the Frankovka was OK, but more than she usually pays at a Czech pub. 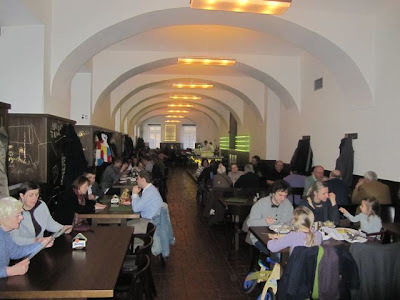 Later in the meal, she also had a half-liter glass of Pilsner Urquell (38 CZK). 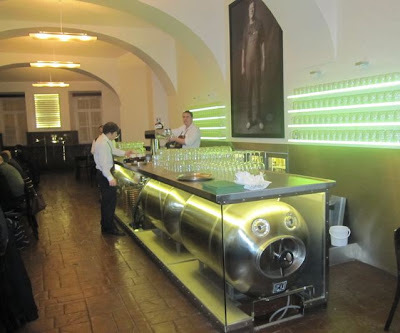 The beer is unpasteurized and stored in a large tank. It tasted good, but the carbonation was less pronounced. 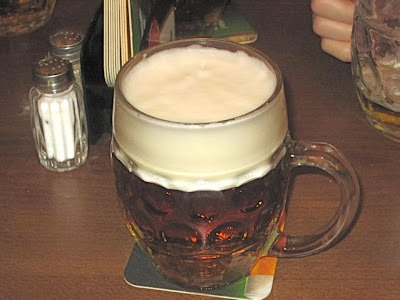 Pivni Filosof has a post about "tanková" beer, and why the taste is usually superior. The real star of the beverages was my orange soda (36 CZK). 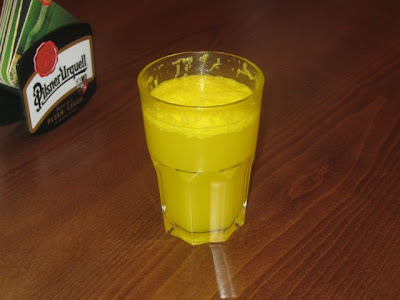 It was a sweet soda water mixed with fresh-squeezed orange juice, pulp and all. I loved it -- beautiful flavor and refreshing. The waiter was brusque and unsmiling, which I've heard is meant to recapture more of the "that's how it used to be feeling." Except that he was quite efficient and generally attentive. 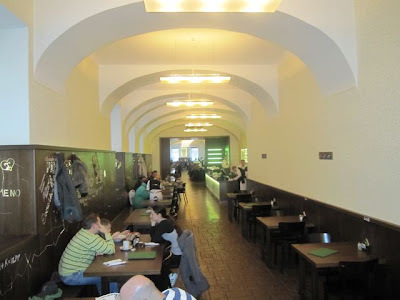 That is not how it used to be, and it's not how it is at many places in present-day Prague. I didn't mind this historical inaccuracy. I should note here that the menu at Lokál is updated daily. Although a number of dishes appear regularly, you never know what will or won't be there. 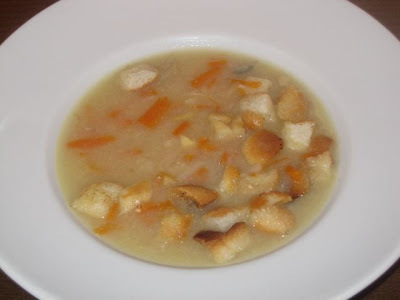 On this day, V ordered the fish soup (35 CZK), which her mother always makes for Christmas. The restaurant's version was bland. "I'm not impressed," V said. Though it tasted of fish, the soup was watery, and there was little evidence of any meat in the bowl. She also felt there was too much shredded carrot. 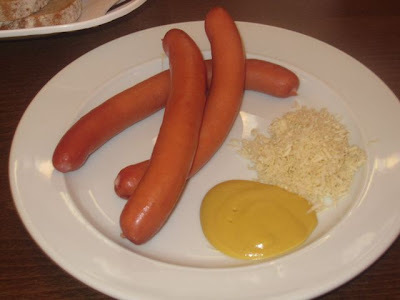 I ordered the wieners (aka Vienna sausage, párky or well.. hot dogs) with fresh-grated horseradish and mustard (78 CZK). These were among the best I've eaten. I was thankful they were very meaty and flavorful with a snappy skin. I've eaten plenty of truly awful, mushy street dogs in this town. I really appreciate the sharpness of the real horseradish. On the other hand, this is not a dish I particularly love, no matter how good it is. I just wanted to see if such a simple thing would be done well. It was. For a main course, V got the beef terderloin and cream sauce or svíčková na smetaně (115 CZK). 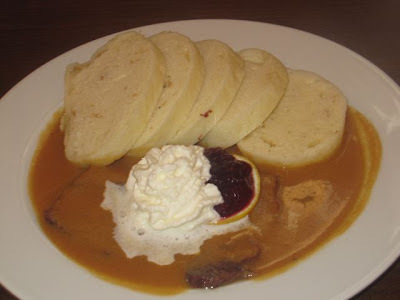 The bread dumplings or houskové knedlíky are extra (28 CZK). This is one of my favorite Czech dishes. 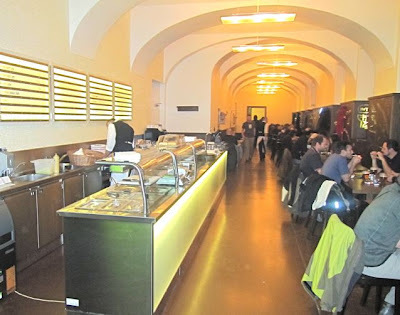 It got a rave review along with the rest of the restaurant on The Prague Spoon. The beef was good, but not as tender as I expected. I thought it standard quality, maybe a little above average. Keep in mind that despite the name, this dish is rarely made from actual beef tenderloin. A lesser cut is usually used. The sauce tasted very good, but was thin. Perhaps it is personal bias, but I like a thicker cream sauce. The dumplings were light and fluffy. I decided to have exactly what V's mother made for me the day before -- pork schnitzel -- řízek z vepřové kýty smažený na másle (145 CZK). The side of potato salad is ordered separately (35 CZK). Theirs was fried on butter. V's mom's was cooked in pork fat. I prefer the richer taste of the latter, but I swear, I don't say this to curry favor or avoid retribution. 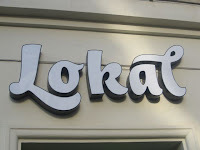 That said, Lokál's is excellent. The quality, tasty meat was pounded flat and not overcooked. 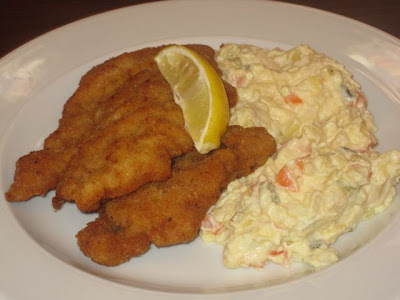 V even said the breadcrumbs tasted fresh and better than the average pub schnitzel. It's among the best you'll find in Prague. The potato salad didn't excite me as much. There were bits of pickle and carrot in there, but the mayo was too heavy for me. I thought it was relatively bland. V's mom makes it with onions cooked in vinegar that give it a sweetness I like more. I went back on a Monday evening about a week later with five friends. It was almost full, but there were a few free tables all evening. The big tunnel of a room was fairly noisy. Major Dan had to go outside to hear a phone call. But it wasn't as bad as I expected. The high ceilings help. I got the beef tartare, tatarský biftek, I'd been dreaming of since my first visit (178 CZK). 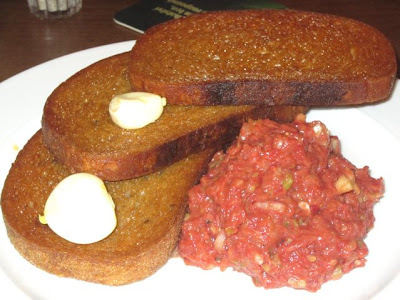 It comes with topinky, rye bread, fried crispy in oil, and whole cloves of raw garlic for rubbing on it. The top-quality minced meat was mixed in the kitchen with salt, onion, garlic, lots of chopped pickle, and I believe ketchup. It made for a tart, slighly sweet combination. I liked it, though the tartare did have a saucy texture. Some restaurants let the patrons mix their own condiments and spices with the meat at the table. With Lokál's version, you take what you get, and it might not be to everyone's taste. 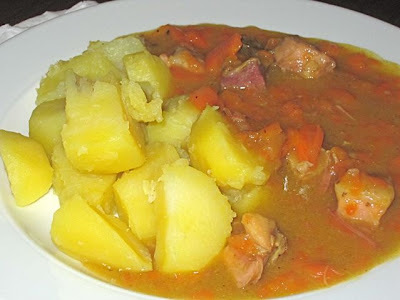 Aside from the 29 half-liters of Pilsner that we split, a Czech friend, PK, had the pork and carrot stew (95 CZK). It really had a very strong carrot flavor to it. I'd never had this dish before, and my first tasting didn't make me a fan. But PK liked it. Lokál really is something locals appear to appreciate. It hits plenty of familiar notes, right down to the nudie pictures in the men's toilets. But the management drives home this localness extra hard by providing menus in Czech only. No English translation menu is available. I was curious how this would work for tourists, since the restaurant is not far from Old Town Square. I asked a table full of English-speaking visitors how they were able to choose their food. They told me their accommodating waiter went through the whole one-page menu with them, translating it. Impressive, but I wonder if they'll be able to keep that up. As for me, I'll probably go back to this restaurant some time, and if I do, I'll get the pork schnitzel. The prices are certainly good for the center. But I won't rush back. I'll be honest. My problem is I just don't love Czech cuisine enough to make a special trip for it, however good it is. Don't tell V's mom, but it's just that simple. Geez. Even at a supposedly 'nice' place, they use sweetened squirty cream from a can on the svickova. have to admit I love Lokal .. I see it leading a long and very successful life and we'll wonder someday how we ever got along without it .. Visited there recently. My friend and I both went specifically for the svickova. "We only have it on weekends", we were told. The food we had instead was good and very reasonably priced, but do beware.